Fancy Napkin: .jack's favourites, at 3 months. 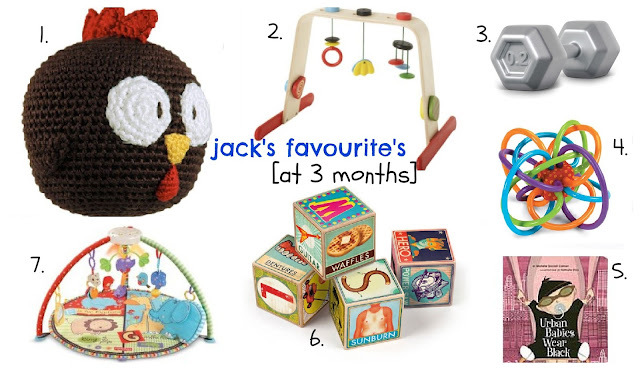 .jack's favourites, at 3 months. although the wee man is only just over 3 months old, he sure knows what he likes. and besides eating and pooping, this guy seriously likes to play. determined little fella this one is, let me tell ya. so while i absolutely love seeing what our friends little ones are currently loving [helps me anticipate the new hot toys for tots!] like seen here and here, i thought it would be fun to share some of my jack bugg's favorite things, at 3 months. 1] dandelion roly polies 'rooster' rattle | this was gifted to jack from his aunt stephanie and the wee man just loves to smoosh this poor little rooster as far into his mouth as he can. 2] ikea baby gym | the boy loves his play gyms! this is currently one of his fav's as he is now able to reach the rings, which he grasps in his tight little hands. he is mesmerized by the noise the wood pieces make when they cling together and can sit under this forever. 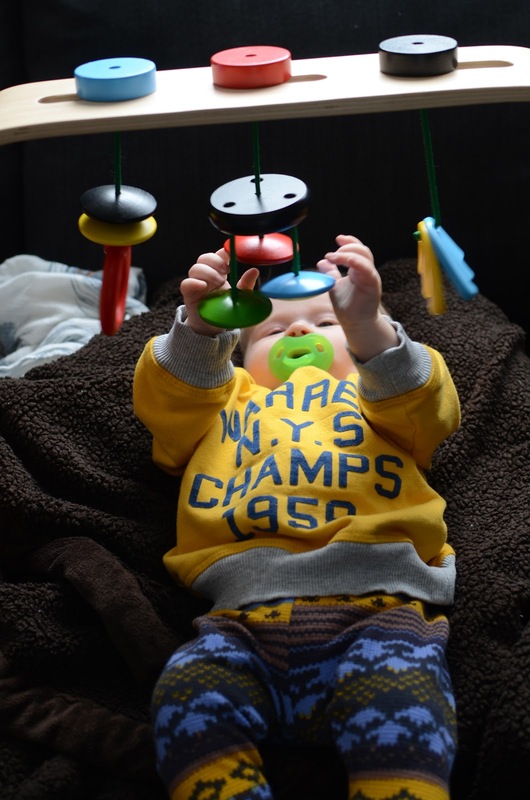 3] baby dumbbell rattle by fred | like father, like son. when i came across this baby rattle, i simply knew it had to come home with me. jack's papa was one happy man when he saw it, and dare i say, perhaps likes it more than even the little man does! the two can now pump some iron together. 4] winkel toy rattle | this was daddy's first toy purchase for the little man. he loves to grasp at the small links and seems pretty darn proud of himself afterwards. 5] urban babies wear black book by michelle sinclair colman | well, this whole series actually tops our favourite books list [more here and here and here]. we just love each and every one of them [we actually have the all] for the modern, cool illustrations and easy to read pages. 7] fisher price play gym | after jack's buddy oliver, shared his play gym a couple months back, jack simply fell in love with it. so mama had to source it out and buy it for her little man, and things have been happy in the land of treb ever since. omg! he is precious. so perfect! and where did you find his pants? they are too die for cute! that's grammy's boy!! he sure studies those toys!! i think he is so smart (but maybe i'm a tad bit biased) love his outfit - adorable!! but then again, i am biased as well!ha! please tell us where you got jack's leggings from? you always have the coolest style and the way you are dressing jack is adorable! he is one cool dude. just put the link above for you. little four clothing. Ahhh! Can he be any cuter or more stylish!?! You are one very cool momma, my dear. those pants are killer! I wuv them and that baby barbell rattle? genius! frack he's cute. arn't they?!?! i freaking love them! and that baby barbell really is genius. thanks friend. wish you could meet him. our babies could bond over drool and such! .jack's threads: the aztec leggings. .red ox inn's vegetable lasagna. .happy 3 month birthday my boy. 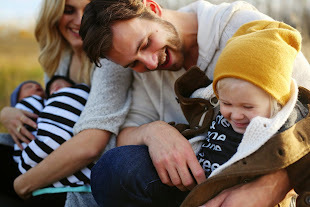 .jack henry: a birth story.